The best San Francisco tours that come highly recommended and offer the most unique and fun ways to see San Francisco in a day. There are over 300 different companies for San Francisco Tours. Some of these are San Francisco bus tours, others are San Francisco bike tours, and a surprising amount are pretty unique tours that can only be found in San Francisco, but there are only a handful out of those 300 that we would call the best San Francisco tours. So, how do you choose the best San Francisco tour with so many options? We’re here to help break down what we consider to be some of the best San Francisco tours around the city. To help travelers visiting San Francisco better understand what each tour offers we’ll be comparing specific tours. We’ll also note if these tours stop at some of the must-see locations like: Muir Woods and the 2,000 year old redwoods that grow there, the infamous former prison on Alcatraz Island, the murals of the Mission District, the panoramic views from Twin Peaks, the old hippie hangout Haight-Ashbury, the iconic Golden Gate Bridge, and the easily overlooked Golden Gate Park on the far western side of the city. We want you to have all the important info needed to make a decision on what type of tour to do, such as: the type of tour, when it departs, how long the tour is, where the tour begins and ends, as well as all pricing options for each specific San Francisco tour. Dylan’s Tours has been leading 100% local San Francisco Bus Tours for over a decade, and this is one of our favorite San Francisco day tours (in fact, it’s one of our favorite Bay Area tours)! The most popular bus tour of San Francisco, Dylan’s Famous Tour, covers the most iconic sites of the SF Bay: Golden Gate Bridge, Haight-Ashbury and the ancient redwood forest at Muir Woods. You’ll also discover the often overlooked murals of the Mission District, bird’s eye view of the city from Twin Peaks, mansions on Billionaires Row, and lunch across the Golden Gate Bridge in Sausalito. For those who only have one day in San Francisco, a combination San Francisco bus tour with Alcatraz tickets will be the best way to see as much as possible. 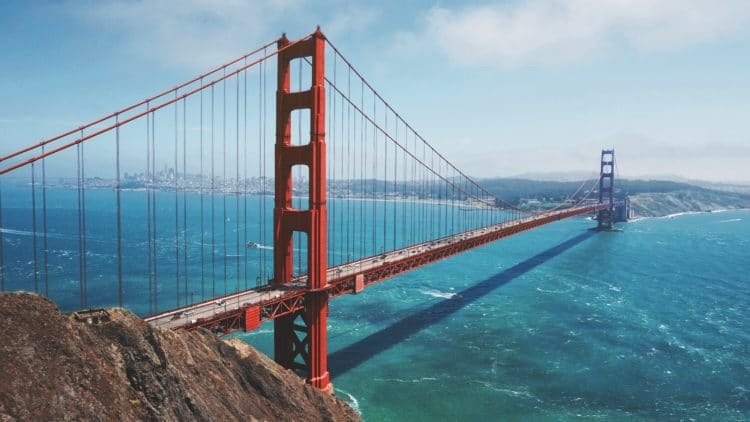 Catching a tour with San Francisco Excursions on their Ultimate Day in SF Tour combines a San Francisco bus tour with a visit to Muir Woods and ends with a ferry ride to Alcatraz Island to explore the former prison. If you’ve already been to Muir Woods and are just interested in a fun San Francisco tour, Vantigo’s San Francisco City Tour explores must-see San Francisco destinations in beautifully restored vintage VW vans. That’s right, VW bus tours of San Francisco are a thing! San Francisco bans tour buses that seat eight or more people from some of the most iconic sites in San Francisco, like the “Full House” House in Alamo Square. These vintage VW vans seat a maximum of seven, which means they can actually go to more places than your typical San Francisco bus tour! If San Francisco bus tours seem too traditional, you might want to consider a San Francisco running tour. City Running Tours offers tons of different runs through San Francisco, but their Golden Gate Bridge Run begins in the heart of the massive National Park home to the Golden Gate Bridge, the Presidio of San Francisco. Catch an early morning run along San Francisco’s waterfront on this intimate small group tour. SF Adventures Tours do not offer your typical San Francisco bus tour, mainly, because there isn’t really a bus involved. Instead, on one of the more unique tours in San Francisco, you’ll discover the city in a pick-up truck converted into an open air adventure vehicle! This four-hour tour takes you off-the-beaten-path to discover the hidden gems of San Francisco and so many of the must-see locations for a really comprehensive San Francisco city tour. Ever since the Gold Rush, San Francisco has been a city of transplants, which makes San Francisco natives a lot like unicorns — something spotted so rarely they’ve become mythical. This makes SF Native Tours pretty special, because all tours are designed and run by locals. So, if you’re looking for tours by locals in San Francisco, SF Native is a good tour company option. Discover the wild histories of the Summer of Love and LGBT movements that have helped shape the San Francisco of today — with a few pints along the way. If you’re looking for stylish bus tours from San Francisco, look no further than the Painted Ladies Tour Company. Tour San Francisco is a VW van with Painted Ladies Tour Company on their three hour San Francisco City Tour. This fun San Francisco tour is known around town as “colorful vans with eyelashes”. That’s right, these vehicles are pretty loved everywhere they go because of the iconic eyelashes on the headlights. Since these vans are smaller, they can go to places other San Francisco bus tours are banned from. Places like the iconic Crooked Street and Alamo Square — home to the “Full House” House! Some of the best views of San Francisco are from the waters of the San Francisco Bay, and we’re confident in saying that this is one of the best San Francisco bay tours. Hop aboard Bay Voyager at historic Pier 39 for a San Francisco Bay boat tour on their Touch of Gold Excursion. This rigid inflatable boat offers some unbeatable views of the San Francisco skyline, Alcatraz Island and Golden Gate Bridge making for a truly unique San Francisco boat tour. Golden Gate Park is massive. It’s about 20% larger than Central Park in NYC and is the largest city owned park in America. The park is over 4 miles/6.5 kilometers long and covers over 1,000 acres/400 hectares of former sand dunes that lead to the Pacific Ocean. One of the best ways to discover all the hidden gems of Golden Gate Park is on one of the private Segway tours of san francisco – the Official Golden Gate Park Segway Tour with TripAdvisor’s top rated Segway Electric Tour Company. In less than three hours you’ll explore parts of Golden Gate Park some locals haven’t even explored before. In our opinion, this is the best Segway tour of San Francisco. Discover the neighborhood that helped put San Francisco on the map as a global food destination — the Mission District. Enjoy a behind-the-scenes look at some of the Mission’s most iconic Latin taquerias as you meet with restaurant owners around the neighborhood on this San Francisco food tour. Free San Francisco guided tours exist? Hell yes! The Haight-Ashbury is an iconic San Francisco neighborhood famed for its wild musical history during the Summer of Love in 1967. Discover this quintessential eccentric San Francisco neighborhood with one of the equally unique love tours San Francisco led by local guides equipped with guitars. This free walking tour of the Haight-Ashbury is a great way to intimately explore this iconic neighborhood. Wild SF Walking Tours has a slew of unique San Francisco tours from ghost tours, food tours and LGBTQ+ tours at modest prices. Cruisin the Castro has been leading cultural and historical walking tours of the Castro District 1989! Learn about the first openly gay politician (EVER) and how the Castro became known as the “Gay Mecca”. Discover LGBTQ and civil rights history — both in the city and across the globe. This affordable San Francisco walking tour offers an intimate and approachable introduction to San Francisco’s infamous gayborhood, the Castro District. This is one of those San Francisco guided tours that we would definitely recommend in order to learn more about the layered history of the neighborhood. Zip up San Francisco’s infamously steep hills on electric bikes with Dylan’s Tours on their 30 mile/32 kilometer Original City Loop E-Bike Tour. Literally go off-the-beaten-path to discover parts of San Francisco tour buses are banned from! Bike along the waterfront on this San Francisco bike tour to see the Golden Gate Bridge, the Pacific Ocean where you’ll find the ruins of Sutro Bath and all 4 miles/6.5 kilometers of Golden Gate Park to enjoy lunch in the Haight-Ashbury before stopping for photos at the “Full House” House. There might be a lot of tour companies offering San Francisco bike rentals to ride across the Golden Gate Bridge, but there’s only one San Francisco tour company who lets you drop off bike rentals in Sausalito and then catch a private Muir Woods shuttle. Dylan’s Tours Bike the Bridge and Shuttle to Muir Woods is the only combo tour of its kind: bike rental from SF to Sausalito and private shuttle to Muir Woods with drop-off in San Francisco! Shortly after the Gold Rush one San Francisco resident, Joshua Abraham Norton, declared he was Emperor Norton I: Emperor of the United States and Protector of Mexico. How did this early city react? Naturally, we plasted the news all over the front page of our newspapers. When Emperor Norton issued his own currency, we accepted it. When Emperor Norton made proclamations that anyone referring to San Francisco as “Frisco” should be fined and jailed, we supported it. (Yes, the whole “don’t call it Frisco” debate goes back to the Gold Rush!). Don’t believe us? Just take a San Francisco walking tour with the time traveling Emperor yourself! There you have it, our favorite San Francisco tours! Did we miss any favorite tours of yours? After being in the San Francisco tourism industry for decades, we feel confident with these recommendations to make the most out of your time in the city, no matter how much time you have here! And don’t forget your San Francisco Tourist Pass to check off more attractions before or after your San Francisco tours!